Notes: Rare cover with Greenwich cds postmark - Immaculate condition, you will not find better. The above Royal Mail Christmas 1982 stamps were issued on 17 November 1982 by Royal Mail and feature the following stamp designs: 12 1/2p While Shepherds Watched; 15 1/2p The Holly and the Ivy; 19 1/2p I Saw Three Ships; 26p We Three Kings; 29p Good King Wenceslas. 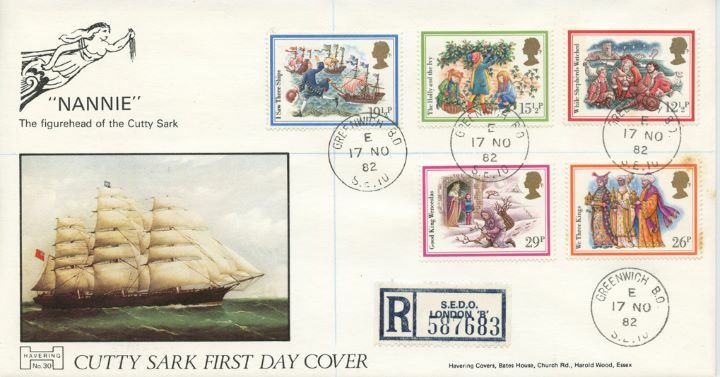 The Cutty Sark first day cover with the Greenwich CDS Postmark postmark has been produced by Havering and features these stamps which can make a very collectible and lovely gift.